Mandapams Fit For The Gods! Home » Mandapams Fit For The Gods! 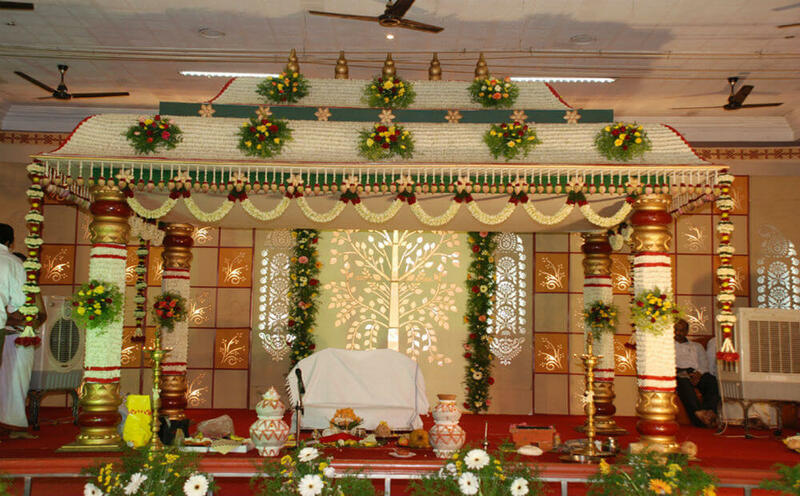 South Indian weddings are famous for their elaborate mandapam decoration with beautiful floral pieces. Mandapam decorations are the fruit of hard labour and intricate planning. From deciding on the flowers to getting fresh flowers and finally arraigning them to look gorgeous is a job for the professionals. Mandapam decoration has gone through a lot of transformations to become modern with a touch of traditional in the recent times. 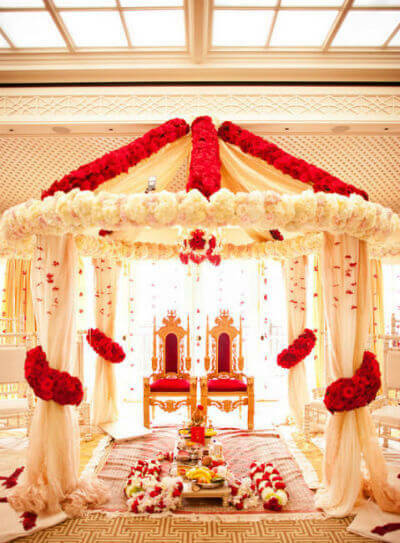 If you are looking for mandapam décor ideas with a twist, you have come to the right place! Paper lanterns have caught everyone’s fancy with popular movies embracing this tradition. You can opt out of traditional decorations and have several brightly coloured paper lanterns hanging along the roof of the mandapam. They are easy to make and add a personalized touch to your wedding as well. Adding a string of fairy light across these lanterns will create a warm lighting that is perfect to get married in. Lighted diyas and candles will as a warm light across the mandap. You can set them along the side of the stage to ensure they do not get overturned by mistake. Placing fresh flowers near these diyas and candles will create a wedding scene right out of a fairy tale. Add plenty of earthy colours to your wedding to bring about the rustic look. You can use wooden planks near the mandap to add a bit of rustic charm as well. Stick to colours like green, dark rusty red, white, etc. Having a few temple bells and flower lanterns hang around the venue will add to the rustic theme of the wedding. Your guests mesmerized in no time at all with this innovative wedding theme. The rustic mandapam is an easy-to-achieve look and can be used especially if you are short on time. Having animals at your wedding might not seem like a very good idea, but you can opt to have animal sculptures created out of beautiful flowers. Elephant and peacock sculptures are trending at the moment, as many people believe that they bring good muck ad fortune. If you are not into a flower themed wedding, you can always opt to have plenty of greenery around the venue and the mandapam in the form of shrubs and green plants. This minimalistic look will look great in the photographs, as you and your partner get ready to exchange your vows. This lovely dash of green will make a huge impact when placed right near the entrance of the venue as well. Wedding mandap decoration is actually a very particular art form that needs experience and a steady hand to get it done well. Most couples like to incorporate modern themes along with the traditional aspects of a wedding to stay close to their roots. Indian weddings are often credited with bringing together two families together to witness the union of two souls. So get ready to marry your soulmate at a mandapam that is fit for the Gods themselves!